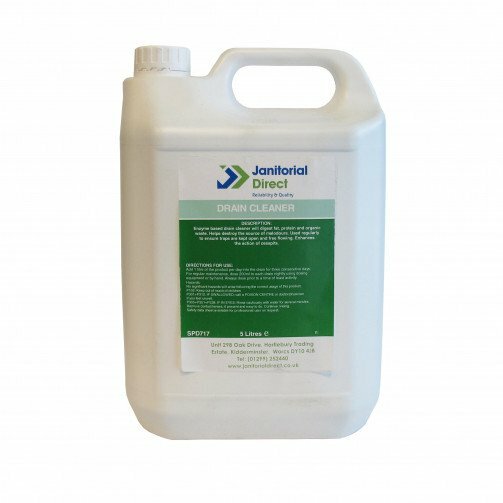 Drain Cleaner is a pleasantly fragranced liquid which digests fat, protein and organic waste ensuring free flowing drains. Neutral and safe to use. A pale green liquid with a pleasant perfume. A powerful liquid suspension which digests fat, protein and organic waste. A synergistic combination of friendly bacterial spores and a unique enzyme system rapidly act to clear drains and keep traps open and free flowing. Destroys the source of malodours and enhances the action of cesspits. Add 1 litre of the product per day into the drain for three consecutive days for more. For regular maintenance, dose 200ml to each drain nightly using dosing equipment or by hand. Always dose prior to a time of least activity.